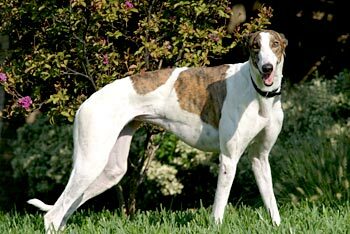 Kelsey, aka PTL Lost Girl, is a pretty, 2½-year-old white and brindle female born December 30, 2005. Her sire is Mulberry Memory and her dam is Ed P's Linda. Kelsey's one race of her career was on September 17, 2007, in Birmingham, AL. She decided to skip to the retired life right away! 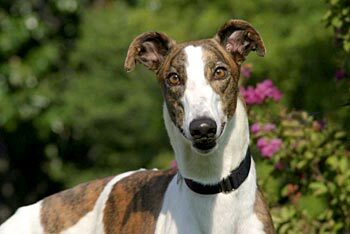 Kelsey is the typical sweet, loving, companion greyhound. 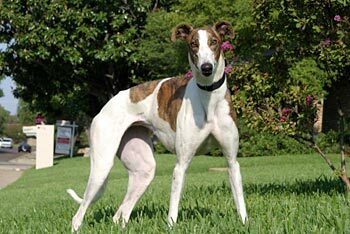 She is currently in a foster home with another female greyhound and two female german shepherds and gets along fine with everyone. Kelsey's afternoon in a home with cats: Kelsey passed her cat test. She is a sniffer! She got several sniffs of Domino, who at one point bowed his head for her to sniff! That was a first. Guess he liked her. She met the other cat who hasn't warmed up to the household canines yet. Got close enough to almost touch noses, then on she went checking out the rest of the house. She's a girl with a curious nose. Seriously, I think this pretty girl is a scent hound. The second we were out the door at the kennel, her nose was to the ground and didn't leave it until we went to the car after a potty break. That pretty much explains her cat test. She loads into the back of an SUV just fine but not the exit. If she'd been a cat, 16 claws would've been gripping the carpet at 110% intensity. This may be the result of her previous vehicular exit. However, her wounds from that accident seem to be healing nicely.